If competition is your thing, you've come to the right place. DCAC participates in 4-5 "focus" swim meets each year. Some local, others hosted by other swim teams from around the country & world. 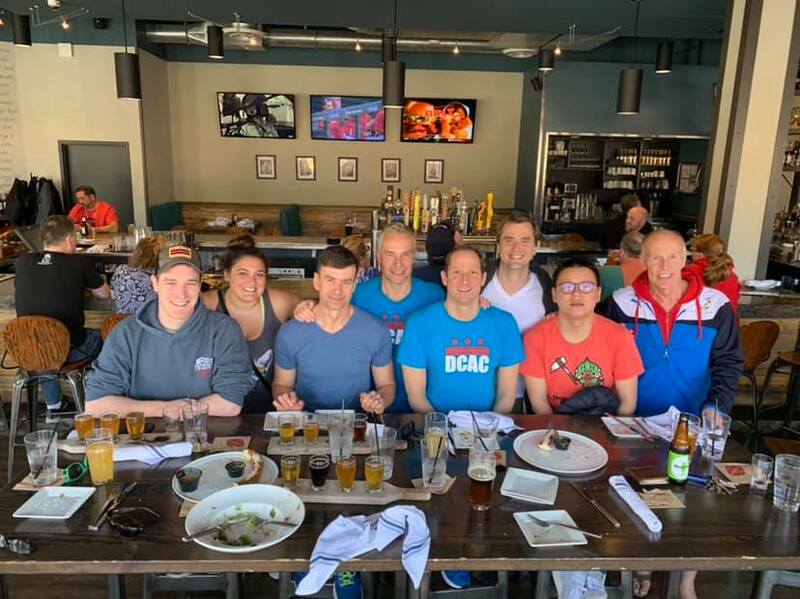 DCAC's big meet each year is either the International Gay & Lesbian Aquatics World Championships (IGLA) or the Gay Games. Past Championships have been held in great places such as Paris, Montreal, Stockholm, Cologne, Reykjavik, Seattle, San Francisco, and Sydney. We have even played host to IGLA twice, in 1996 and 2008! Although competition is optional, it is a great way to get to know your teammates and provide you with that extra bit of motivation in practice. Additionally, the joy of masters swimming is that everyone can compete, regardless of age, ability, or experience. If you have any questions please email DCAC's Competition chair. In addition to pool swimming, many DCAC swimmers participate in various open water swims, triathlons, and running races. 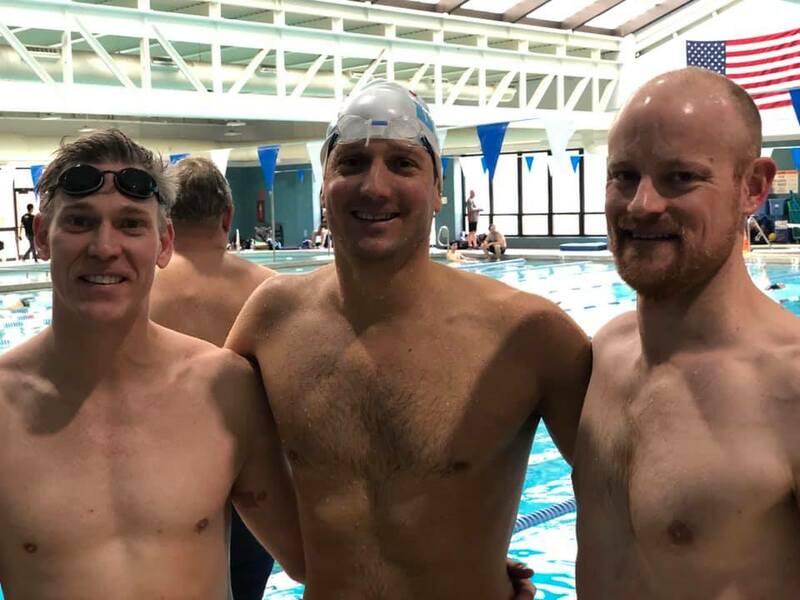 Many members are also part of the DC area LGBT sports leagues like the DC Front Runners, TriOut Multisport and Washington Wetskins Water Polo Team. Sunday January 20. Intrasquad Meet at Wilson. This meet was SCY. Following a 20 minute warm-up, we divided the team into 2 and had a friendly competition. The event line-up was 50s, 100s and three relays. After the intrasquad meet we hosted our new member brunch at Tenley Bar. Sunday January 27. Tropical Splash at the George Washington Rec Center in Alexandria. This meet was SCY. Registration can be found here. Sunday March 24 to Saturday March 30. Team New York Aquatics Swim Camp - Open to everyone. Palm Springs Swim Center, Palm Springs, CA. Two-a-day workouts with long course training in the morning and short course yards at night. Registration is here. Wednesday March 24 to Saturday March 30. Tel Aviv Games in Tel Aviv, Israel. This is a multi-sport event with the swimming being SCM. Registration is here. Saturday March 30. Albatross Open at the Shriver Aquatic Center in Bethesda.This meet was SCM. Registration can be found here. 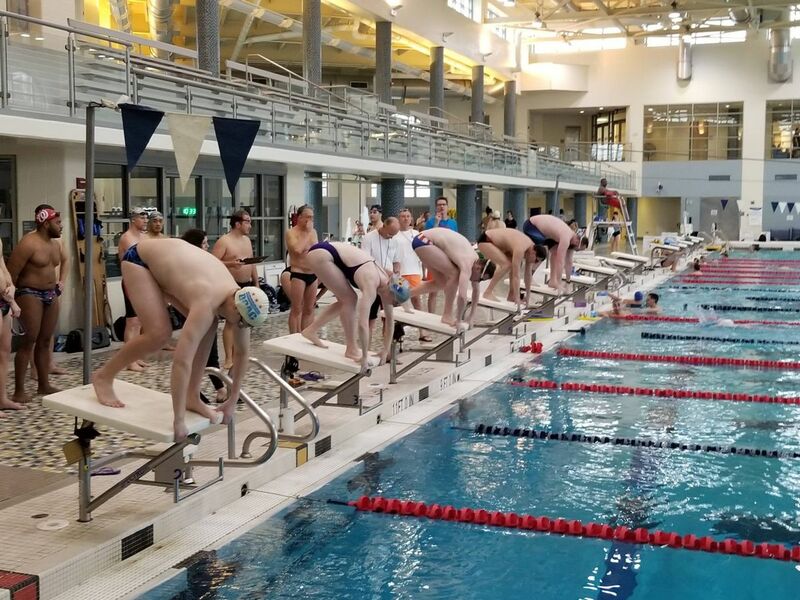 Ancient Mariners Meet Recap- DCAC had 6 swimmers who competed at the Ancient Mariners Meet. 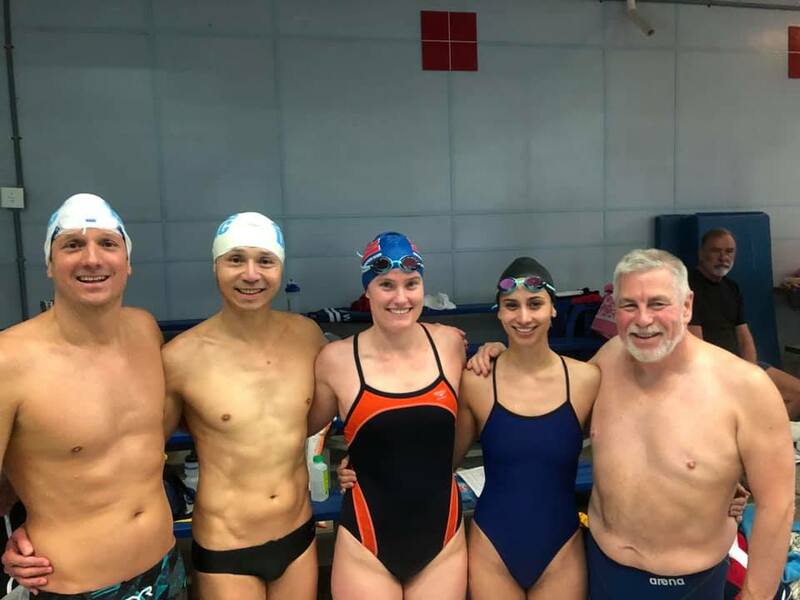 It was the first DCAC meet for Darren Fenwick and Renae DiBartolomeo.They were joined by Ted Reyes, Barry Haddan, Meredith Stakem, and Neill Williams. Meredith set 4 new team records in the 35-39 age group (50/100 free, 50 back, and 100 IM). She was also given the Fastest Women award! Renae set a new team record in the 50 breast for the 24-29 age group. And Neill set 2 team records (50/100 back) in the 50-54 age group and a meet record in the 100 breast. Congrats to all!! Friday April 5 to Friday April 7. Colonies Zones Championships at George Mason University. This is a three-day SCY meet that many of the teams in the area attend. We have won the small and medium team trophy at this meet in the past. Registration is here. Entries are due March 29th. Thursday April 25 to Sunday April 28. USMS Spring Nationals in Meza, AZ. This meet is SCY. Registration is here. Saturday April 27. Liquid Assets Boston Tea Party, Boston, MA. This meet is SCY and at the Zesiger Aquatic Center on the campus of MIT. Registration is here. Sunday June 9. Chesapeake Bay Swim. Open water - 4.4 miles. Website is here. Sunday June 23 to Sunday June 30. IGLA World Championships at Corona Park in Flushing Meadows, NY. This is our big focus meet of the year. Corona Park is a sports mecca and was created as the site of the 1939/1940 New York World's Fair and also hosted the 1964/1965 New York World's Fair. On the way to the pool you will pass the Billie Jean King Tennis Center. Registration will be capped at 1200 swimmers and can be found here. Saturday July 13. 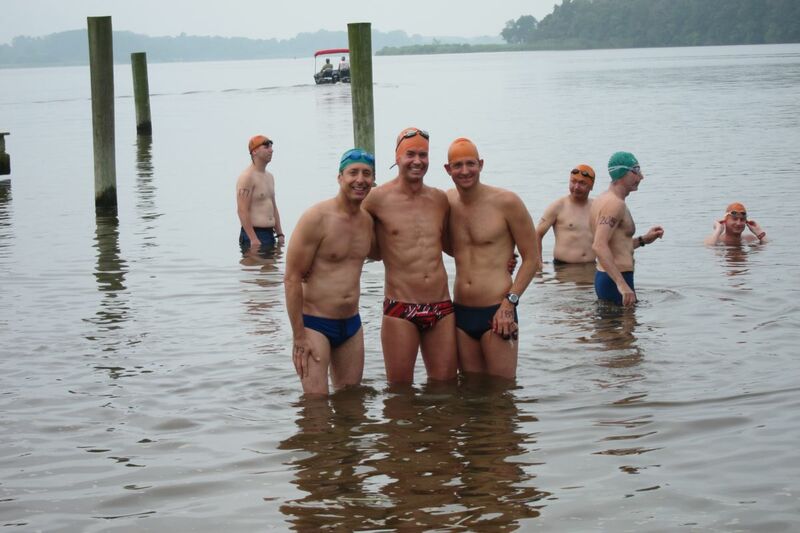 28th Annual Maryland Swim for life at the Chestertown River. This is our annual charity fundraising open water swim. You can choose to swim 1, 2, 2.4, 3, 4, or 5 miles. We encourage everyone on the team to get involved in fundraising, volunteering, and/or swimming. Event details can be found here. Wednesday August 7 to Sunday August 11. USMS Summer Nationals in Mission Viejo, CA. This meet is LCM. Registration is here. Saturday September 7. 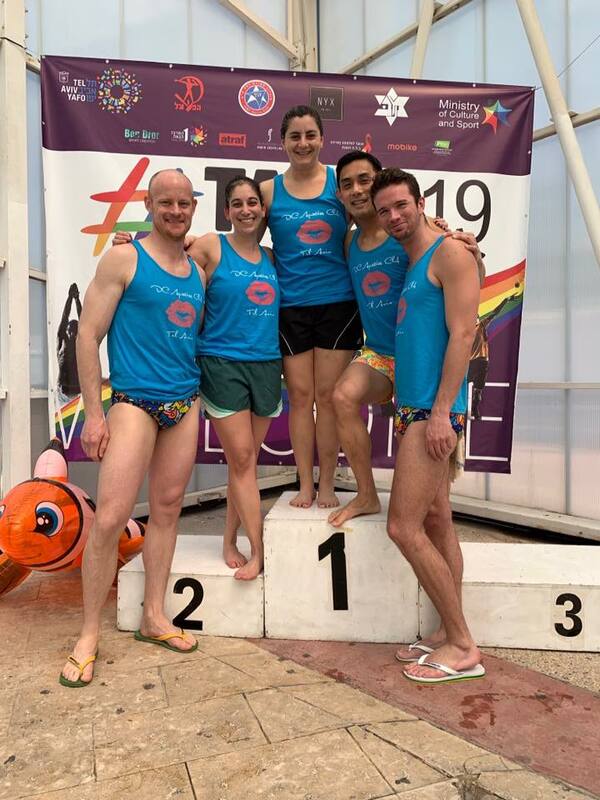 GLLAM 2019, London Aquatic Center, London, England. This meet is LCM. Over 300 swimmers from 15 countries attended this meet in 2018 at the London Olympic Pool. Registration is here. Saturday October 12. Columbus Day Classic. This is our bi-annual swim meet and will be SCY at the Wilson Aquatic Center. Event details are here. Saturday November 9. Coupe de Montreal in Montreal, Canada at Complexe sportif Claude-Robillard. The date has not been announced but it is usually the second Saturday in November. This meet is SCM. Details coming soon. Website is here. So get out your phones and mark your google calendars with these DCAC focus events!